kART Across America: Some people wear Superman pajamas. Superman wears Chuck Norris pajamas. It’s sort of raining and it’s cold. What if it actually starts to rain? Ralph is the only man in Van Horn, Texas who knows how to help. He does and tries to charge us $93. Jeremy talks him down to $38. I fall asleep at lunch. Jeremy is trying to figure out what it means that there are bags of water over the door and salad bar. Weird. We ambush our second Couch Surfing friend, Rachel Lindley, at her place of employment, Marfa Public Radio. She’s surprised (has she heard that we’re coming?). Ricky at the coffeeshop next door makes us Shortstop Shakes and wears a t-shirt that says “Some people wear Superman pajamas. 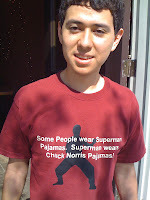 Superman wears Chuck Norris pajamas.” I like Marfa, Texas already. Chase and Rachel are vegans. We pick arugula from their garden. Obama’s as outraged as we are by the price of it at Whole Foods so we’ll accept the gracious salad and pasta meal Chase whips up. Spicy, garlicky, sweet, great flavors. We eat on the rooftop as the sun sets, laughing about the illusive Marfa Lights. Jeremy loses the Ro-Sham-Bo and sleeps on the couch. I get the bed.